Hubby found the cutest wedding reception venue at the L&N Depot in Etowah, Tennessee. He, our soon to be happily married daughter and our older daughter went to take a look. It was, as they say, love at first sight. The venue would also be good for rehearsal dinners, nonprofit functions and just about any other reason you can come up with. The L&N Depot in Etowah, Tennessee is smack dab in the middle of the historic district. They have an upstairs meeting room on top of the portico. The building was constructed in 1906. Back then the travelers would get out of their carriages underneath the shelter. Today it serves as a meeting space and an asthetic touch to a historic building. There are actually two meeting rooms in the L&N Depot in Etowah. Both are available for rent. The first is a smaller room on the ground floor. A room next to this meeting space contains a fully equipped kitchen. The room that I just mentioned is upstairs. It is a large meeting space with a kitchenette in a separate room off to the side. We were surprised that the room is available for less than $200 (at the time of this writing). The economical prices will fit any budget. Rental is available through the Etowah City Hall. The city itself is known at the 'Gateway to the Cherokee National Forest' and an 'antique and bargain shopping mecca'. There is plenty to do in Etowah. One of the popular activties is to ride the Hiwassee River Rail Excursion train. Order tickets. Pick up the shuttle in the L&N Depot parking lot and get ready to be transported to history or make it a part of the pre-wedding celebration. 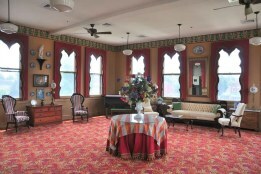 The rooms at the depot in Etowah look like they would be perfect for a wedding reception or rehearsal dinner. If you've had an event here let us know by leaving a comment below. We would love to hear from you.